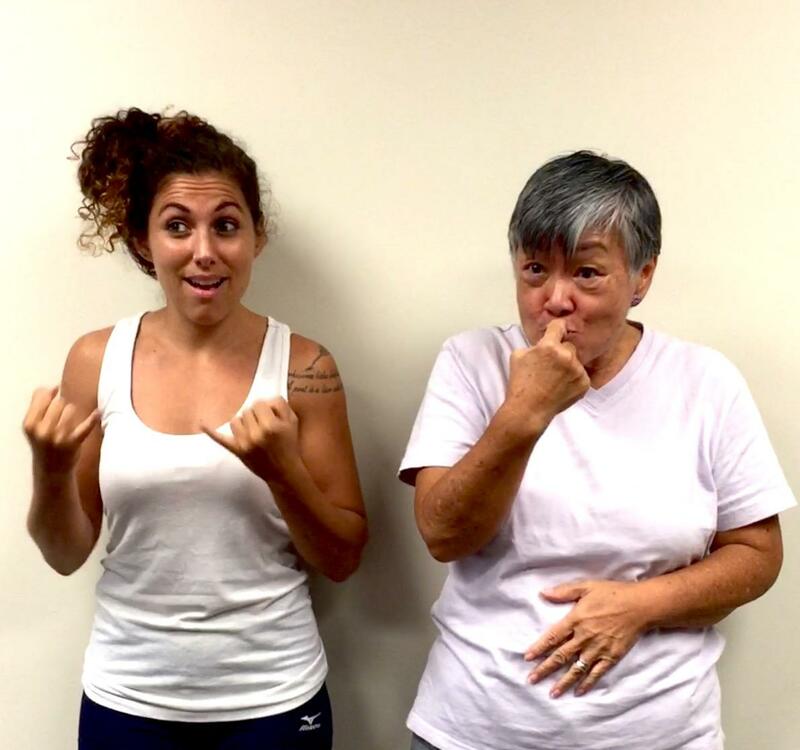 (l-r) Emily Jo Noschese demonstrates American Sign Language alongside Linda Lambrecht who is showing Hawaii Sign Language. This is a still from the video below. Lambrecht and Noschese were working at the well used CSC, Comprehensive Service Center for People who are Deaf, Hard of Hearing or Deaf-Blind on Beretania Street where a kūpuna coffee talk, and classes in cooking, advanced math, and signing are offered. In 2013, scholars and linguists worldwide were stunned by the discovery of a new indigenous language in Hawai‘i. Hawai‘i Sign Language was the first new language discovered in the U.S. since the 1930’s. There are about seven thousand spoken languages in the world, half of which are expected to be lost in the next fifty years. An even more dire fate could await existing sign languages. HPR’s Noe Tanigawa reports on efforts to preserve Hawai‘i Sign and its unique view of the world. (l-r) Emily Jo Noschese and Linda Lambrecht demonstrating ASL and HSL respectively. fundraiser tonight from 6pm at the School on Lē‘ahi Avenue. Donations are gladly accepted to help fund programs for the Deaf and Blind at Camp Erdman. Admission to the Thanksgiving dinner is $10 for anyone over 18, $7 for students and seniors, free for kids five and under. Find outmore about the dinner and where to donate here. For a look at HSL and ASL side by side, click here. In an average population, one in a thousand individuals is born deaf, and the latest figures suggest about 3,700 deaf people in Hawai‘i. That’s quite a few! Why don’t I know anybody? 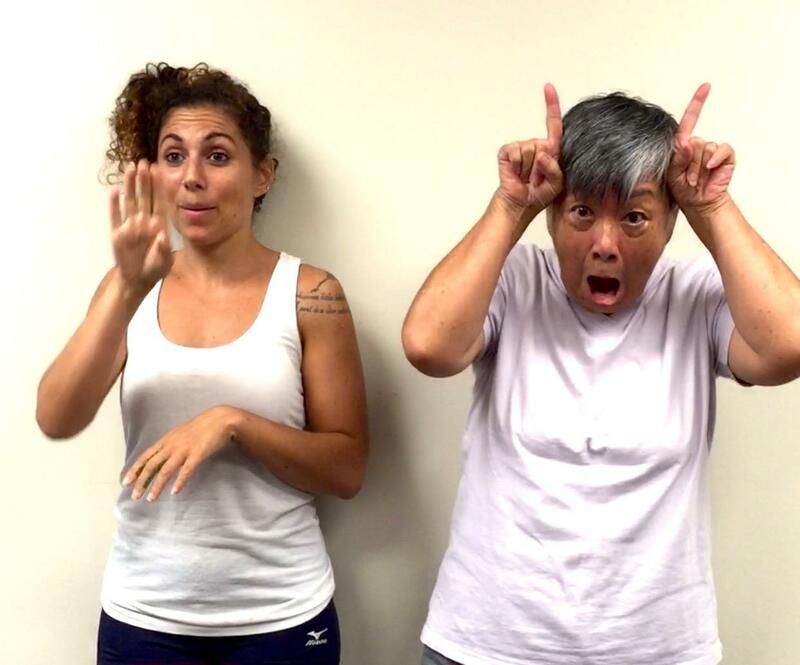 “You’ve never met any because deaf people in Hawai‘i now form a separate community.” So says James “Woody” Woodward, Co-Director of the Centre for Sign Linguistics and Deaf Studies, Chinese University of Hong Kong and Adjunct Professor of Linguistics at UH Mānoa. He says Hawai‘i Sign Language, HSL, is an indigenous language, in use here by the late 1800’s. Deaf people may have had it better in old Hawai‘i, where a letter from 1821 seems to indicate the deaf were more integrated in the community and many hearing people probably knew some sign language. (l-r) Linda Lambrecht and Emily Jo Noschese can communicate through signing or side by side with text. There is also a nationwide There is also a service available for signers called Sorensen Video Relay which allows telephone conversations through an interpreter. In Lambrecht’s youth, the deaf were given body hearing aids that transmitted vibrations, and signing was discouraged because speech was considered more mainstream. After WWII, more deaf moved to Hawai‘i to work or retire and HSL took a second seat to American Sign language, ASL. Interesting. For the past three years Lambrecht, Woodward, and others have been working to document HSL, recognized as unique because 91% of its vocabulary is different from other languages. In their new curriculum, Lesson One begins saying, Deaf people have two names, one given by their parents, and a name-sign given when you’re accepted by the Deaf community. The HSL name often highlights a physical characteristic or behavior, often humorous, blunt, and personal. Lambrecht says she has more facial expression with HSL, which uses the body, head to lower torso, and even the leg to sign for kick. But sign languages are much more than action gestures, the signs might be based on cultural practices, but they evolve. For example, I asked, what does that mean? Linda made a roof shape with her finger tips, then a wave. “It means bus stop. It’s the sign for house, changes to this, drop this hand, and you wave for the bus to stop,” Who would have guessed? Woodward says, before the 1960’s, HSL was in wider use, and what’s called CHSL, Creolized Hawai‘i Sign Language, was also used. Woodward says there are about thirty people remaining who can use that pretty much 50-50 mix of ASL and HSL. You don’t think it could ever be widespread again? In the last three years, a dictionary and teaching materials have been created, along with a video archive of speakers. There is a split in the Deaf community around HSL, some feel it is not a unique language or worthy of preservation. Lambrecht and Woodward estimate the Big island has three people who use HSL regularly, but they’re isolated. On Kaua‘I, there maybe two HSL signers, maybe five on O‘ahu, and two more on Moloka‘i. Another fascinating part of the Deaf community is composed of the hearing Children Of Deaf Adults, they're called CODAs. Many CODA feel they have their own culture at the interface of hearing and Deaf communities. Anyone interested will find a course on documenting, describing and preserving Hawai‘i Sign in the Linguistics Department at UH Manoa, taught by Professor Woodward. There is already an HSL study guide and bilingual dictionary, and Lambrecht is working to share her knowledge and document other HSL signers. The transition of three state-run Maui medical facilities to Kaiser Permanente has hit another snag. The move will now be delayed until next summer. The decision has left hospital officials worried about further cuts to services and staff.